Latour has been added to the list of people I plan to avoid forever (along with Foucault). I did not enjoy reading about ANT. I have read about and used ANT before in digital humanities; however, I did not read Latour. I cannot remember who I read, but I remember enjoying it. This was not as mentally exhausting as Foucault, but it wasn’t a walk in the park. 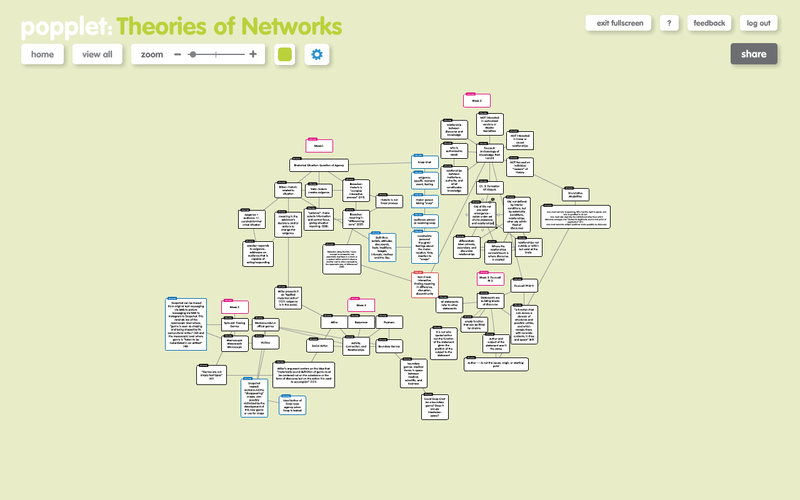 As for my mindmap, I added redefining social, actor, and social. I presented these in the sense that the entire first section was focused on redefining social. There was also a focus on expanding on what social sciences can now do. I like the idea of moving away from social being presented in the same way as “wooden.” There is much more to social than a position as a descriptor. Actor was connected to everything (because inanimate things also work as actors). This made me think of the saying: everything is rhetoric and everything’s an argument. I interpreted this more as everything is connected/interrelated than everything is actually an argument/actor/rhetoric. I like that you homed in on his ideas about redefining the social. Rhetoric is in/informed by/creates the social so that the two are heavily intertwined. Keep up the good fight and plow through those theories.